The Wells Cathedral is officially known as the Cathedral of St. Andrews. The Wells Cathedral is considered the most beautiful cathedral of medieval British history. The Wells Cathedral, officially known as the Cathedral of St. Andrews, is located in the splendor of the small town of Somerset in Wells. Its existence dates back to the 13th century when it was built as a dedication to Saint Andrew, the Apostle, under Bishop Reginald and Jocelyn. The Wells Cathedral is the mother church of the diocese of Wells and the Seat of the Bishop of Bath and Wells. It is considered the most beautiful cathedral of medieval British history and the most poetic of the English cathedrals with its beauty lying beneath the Gothic and Early English architectural designs. The first church was established in 705 as a dedication to Saint Andrew the Apostle. Remains of the first church are seen from the excavated foundations in the cloisters and the baptismal font in the southern transept. In 1175, Bishop Reginald conceived the need for a new cathedral with revolutionary architectural designs from France. It took about eighty years to complete the first building of the Cathedral from the eastern to the western front. The Protestant Reformation in Britain led to the destruction of the monasteries in the cathedral, hitherto its closure in 1645 during the reign of Charles I. During the Monmouth Rebellion, rebel soldiers invaded the cathedral turning it to their residence. However, after their defeat at Sedgemoor, they were held in the church as prisoners. As its moniker suggests, ‘discreet Cathedral city of poetic imagination’, the Cathedral lies under the resonating Mendip Hills filled with the splendor of wells, springs, and fountains. 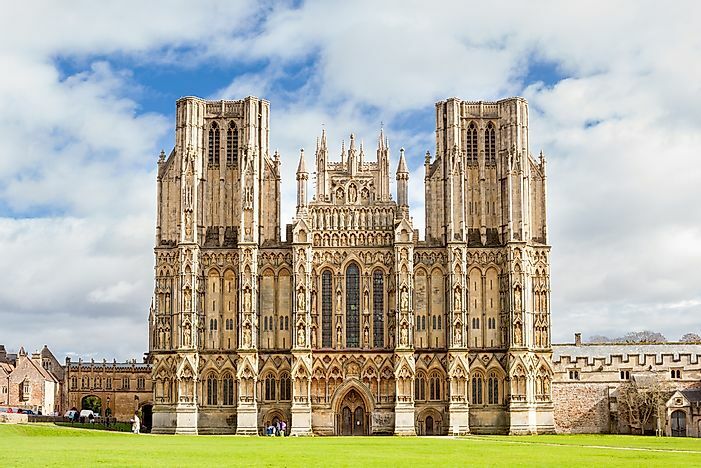 Wells became the first English Cathedral not only in Europe but in the world to be built in an entirely Gothic style. Its architects dispensed all the features binding the contemporary east end Canterbury Cathedral and the earlier buildings of France to the Romanesque. Upon its completion in 1306, the Cathedral was already too small to accommodate the growing congregation and grand procession of the clergy. John Droxford, the serving Bishop at the time, initiated the expansion of the Cathedral by commissioning the heightening of the central tower and the Lady Chapel. Ralph of Shrewsbury, followed with the expansion works by extending the choir as well as the Bishop’s palace and the Vicar Hall to give choir members a residential and recreation place away from the temptations of the city. The most outstanding features of the Cathedral encompass the 500 sculptures on the West Front of which 300 have survived since its inception. The octagonal shape of the Chapter House is another outstanding feature with a breathtaking sculpture and light soaring to the sky. Conservation efforts have been taken up in the Cathedral since 1840. Most of the work involves stonework repairs and cleaning of the external walls and parapets of the walls in the aisles and the Corpus Christi Chapel in a bid to retaining its original fabric. Other conservation works have commenced in the Vicar’s close a way of connecting with the community in which it serves.